TL;DR: Dumpy twin on the outskirts of Gary. History: Midwest Drive-in was one of the earliest successors of the drive-in theatre business in the 1930s, before venturing back indoors to capitalize on the postwar explosion of suburban shopping centers being constructed. The company built small single-screen theatres designed to compliment these shopping centers – making them easier and cheaper to maintain than older, urban movie palaces, while providing the convenience of nearby retail to suburban moviegoers. In the 1950s the company began expanding into other ventures such as dining and leisure, and changed their name to General Drive-in in 1960 – four years later they would become the General Cinema Corporation. By the 1970s the company was the largest operator of movie theatres in the United States – at their prime operating over 600 screens, and was introducing and converting single-screens into multiplexes for added convenience. The Dunes Cinema of Miller, IN (on the eastern outskirts of Gary) was a textbook GCC twin with 400 seats in each theatre, opening on the east end of the Dunes Plaza in April 1973. Initially known for showing Disney, blaxploitation, karate, and second-run flicks from the area’s other twins, the Dunes later shifted toward, and found success in showing films that were exclusive to the area. With the decline of Gary spreading to the Miller area, General Cinema made the Dunes a dollar house in 1982, which only attracted an increase in an already sketchy crowd. Following a robbery, the Dunes would shutter permanently less than two years later. General Cinema Theatres, as they would later be-known, continued to be an innovator in the industry through the 90s before succumbing to financial woes at the turn of the millennium, with its final assets being acquired by AMC Theatres in 2002. The Dunes Plaza itself is also now largely-abandoned, with the exception of a flea market and something called “All-Mart” on the west end. Explore: The Dunes was my first venture into the Miller area of Gary; I had first learned of its existence through photographs by David Tribby, and became further-interested when a friend of mine pulled off a rescue of the massive CINEMA I-II letters from the front of the building. 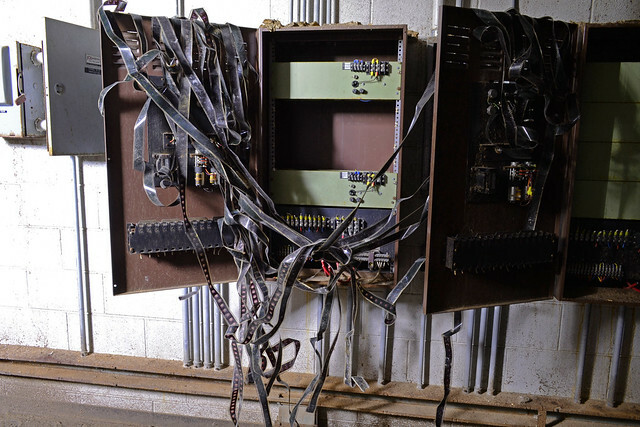 Despite being able to re-light the neon in one of the letters, the rescue otherwise proved to be an ill-fated effort due to rust, and unfortunately they have since been scrapped. 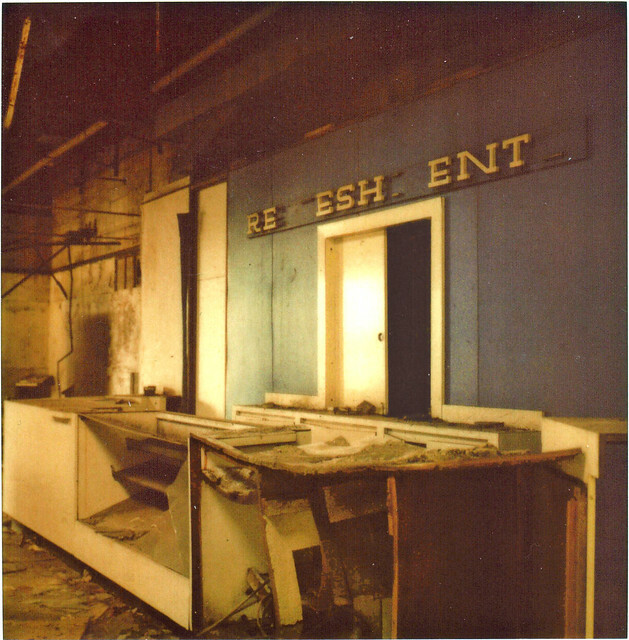 The lobby area, while mostly in ruins, is an absolute time capsule of the early-70s: still retaining its concession bar and a few letters of a sign that once-read “REFRESHMENTS”. 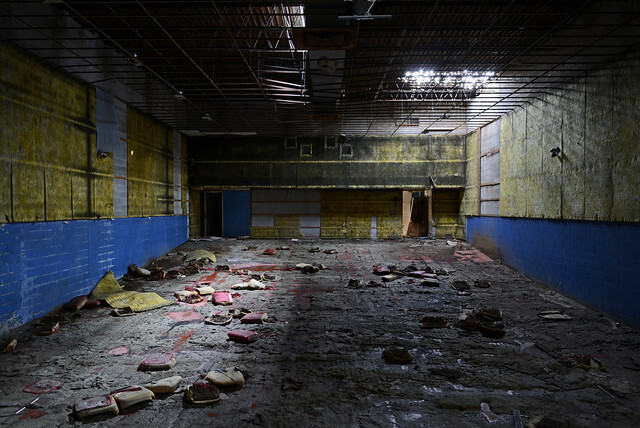 I have only seen lobby decor like this at the shuttered theatre in Waukegan’s Belvidere Mall – another GCC location which predates the Dunes by eight years, and was originally a single-screen turned-quad. Entry to the theatres are on either side of the concession stand. Heading to the left (screen 1) the first thing you notice is that it’s rather well-lit thanks to the rusted roof that resembles Swiss cheese. All 400 seats, along with any sort of decor, are long-gone except for some moldy cushions left behind – the metal likely taken for scrap. The screen is still there, but torn in the middle, revealing a small cavity with an exterior door. The same can mostly be said about screen 2, though lacking vegetation on the floor and the roof is in better shape which really does nothing but make it almost pitch-dark. The soundproofing material still clings to the walls, here, though the only movable piece of metal spared by scrappers was a vintage-looking trashcan stashed in the cavity that should be hidden by the screen (also torn in the middle). 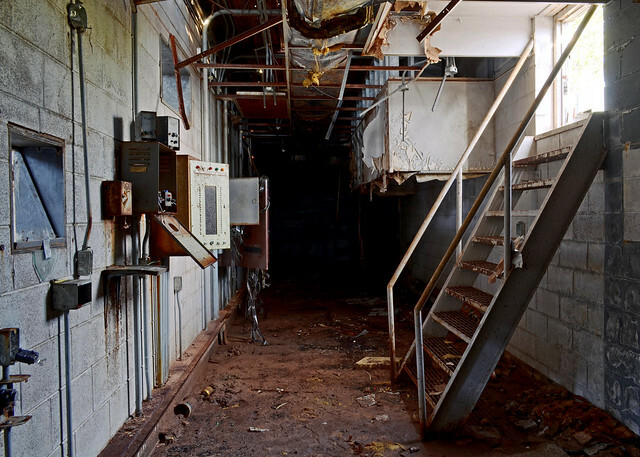 A stairwell beyond the entry to screen 2 leads to the second floor: containing a few offices, storage, and one long projection room for both screens – the projectors are, naturally, long-gone. Still wadded-up on the soaking-wet floor, though, was 35mm film showing the last seconds of the 1974 sci-fi flick “Dark Star” (turns out the very scene can be found here). UPDATE: Demolished in the first half of 2016. 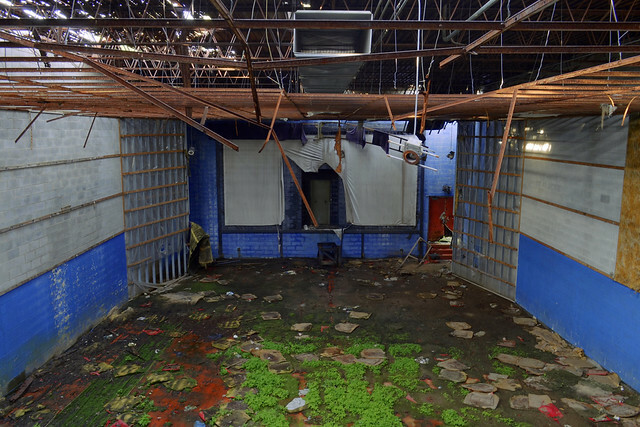 Oddly, the rest of the mostly-abandoned strip mall is still standing.